Lisa submitted the amazing baby diaper cakes below. One for the dad-to-be and one for the mom-to-be. His and hers - How Fun! 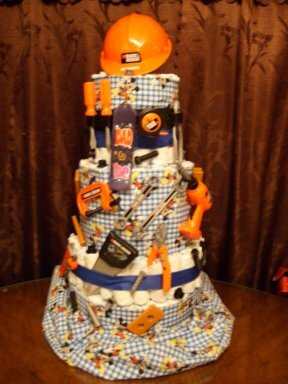 The Black and Decker cake is one baby shower gift that Dads-to-be everywhere would love, and the Teddy Bear cake would definitely be the highlight of the baby shower for the expectant mother. These baby diaper cakes are a wealth of cute ideas for all of us making our own diaper cakes. 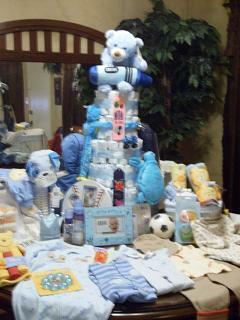 A huge thanks to Lisa for sharing her creativity and time to help "pay it forward" with her darling diaper cake ideas! I found your site a few weeks ago when i was looking for diaper cake instructions. Since then I have made these two cakes. Both cakes will be used at the same shower. Mommy and daddy will each have one. 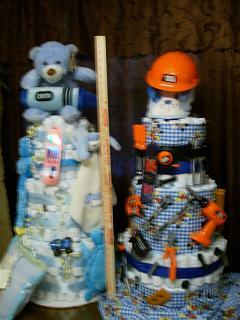 The blue Teddy Bear cake has 226 size 1 diapers for mommy and the Black & Decker cake has 250 size 2 diapers for daddy. Thank you for having the instructions on the site. I have put off making them for about 3 years when i was warned how hard they were to make. I wish i had ignored that advice because they are so easy and fun i can't stop making them. I just made a small one for an office shower and the new mommy loved it. In fact that was her first one she had ever seen. Thanks again. Thanks Lisa! What a beautiful pair of diaper cakes!! Make your own diaper cake using these easy-to-follow diaper cake instructions & pictures .